Christmas is only 2 days away and by now it's hard not to get excited. Houses are beautifully decorated, the malls are filled with people shopping for last minute presents and the air is filled with a boisterous atmosphere. You can feel that 'tis the most wonderful time of the year. This year I have seen the minimal approach to Christmas decor takeover and I'm really loving it. To see so much beauty in such simplicity is truly amazing. The crisp whites contrasting with the greens is stunning and almost gives it a monochromatic theme. 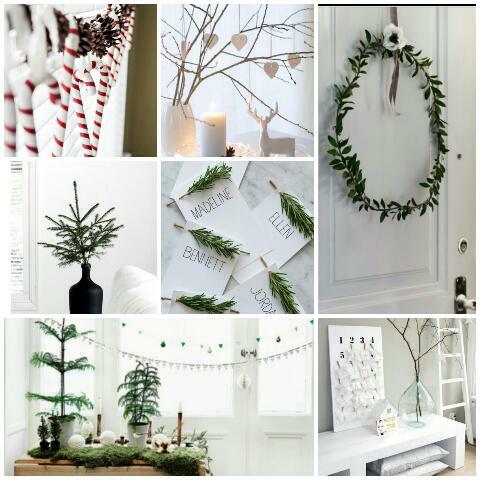 It's lovely to see the usual items associated with Christmas such as wreaths and candy canes with a modern twist. I also love the use of triangle banners as they add an element of fun. I always enjoy making triangle banners because they are easy to make and serve as a fabulous decoration for any occasion. The fresh and minimal theme also makes me think of the new year. Many people think of a new year as clean sheet and a chance to start again. As 2016 quickly approaches I can only be excited for fresh start as 2015 has not been a very good year for me. I'm happy to embark on a new journey!